Training is imparting a specific skill to do a particular job, while development deals with general enhancement and growth of individual skill and abilities through conscious and unconscious learning., The main purpose of training and development is to improve the employee competencies and confidence, organizations can maximize efficiency and effectiveness of their human assets. Armstrong (2009) clearly stated in his book that organizations could benefit from training and development through winning the “heart and minds of” their employees, so as to get them to identify with the organization, to exert themselves more on its behalf and to remain with the organization. It has been widely accepted that prolonged static, awkward and constrained postures during office work causes musculoskeletal stress on different body regions of seated workers, including call center operators and is a major factor in development of musculoskeletal disorders [popularly known as MSDs] such as pain in neck, back, shoulders and wrist, prolapsed intervertebral discs, upper limb repetitive strain injuries, visual fatigue and mental stress, as observed in countries like Nigeria and Thailand., Computer use increases the risk of MSDs among newspaper office workers. The more time spent on this activity, higher the risk of developing such injuries. Even in the United States, according to reports published by U.S Department of Labor in the year 2011, MSD accounted for 33% injuries resulting in sickness absenteeism as well as loss of productivity (occupations commonly associated were store clerks and nurses, to name a few). User-centered seating evaluations tend to emphasize user outcomes associated with long-term sitting such as low back disorders., Marras, (2005) reviewed research that demonstrated interactions between basic tissue and musculoskeletal biomechanics with individual differences (e.g., personality, gender, and LBD history), task demands and stress. He argued that to increase our understanding and the long-term value of practical implications, investigations of lower back disorders should focus on its causal etiology – one of the most important causes being abnormal work postures. Hence this study was undertaken to create awareness on safe working postures and training on office ergonomics especially in arrangement of work-stations ergonomically, practicing desk-stretches, ensuring eye-protection with emphasis on sustainable behavior change among employees to work safely along with improving their physical activity. As it is a priority to create awareness on office ergonomics for safer working in all global corporate organizations - horizontally and vertically at all levels of work, hence with a combined team effort of HR, Safety and Medical and Occupational Health Departments, a cross-sectional study encompassing global corporate office employees' was undertaken (2012-2017) n = 3503 in India, Dubai (U.A.E), Nairobi (East Africa), Durban (South Africa) and South East Asian countries (Philippines, Vietnam, Indonesia, Singapore, Malaysia, Thailand and Sri Lanka). Regarding consent for participation, for all practical purposes, the investigators' approached employees through formal channels of communication. Quick training; Live demonstrations of 10 minutes on each floor, wing - wise on a currently occupied work-station educating on same parameters' (n = 1738). After the training sessions, a feedback form was circulated among the participants and immediate feedback was taken by a pre-tested and validated feedback form (on the spot), with five structured questions having only 13 check-points on - the usefulness and efficacy of the training. The questionnaire covered following parameters about the training method; viz-simplicity and comprehensiveness of training, practicality and replicability, knowledge enlargement, skills enrichment and inspiration to influence behavior modification. The employees had the option to select any one of the four alternatives-whether they agreed, strongly agreed, disagreed or strongly disagreed on the above parameters. To make the feedback complete, the form also included special comments, if any - on what was liked best, liked least, usefulness of the training as well as suggestions for its improvement. 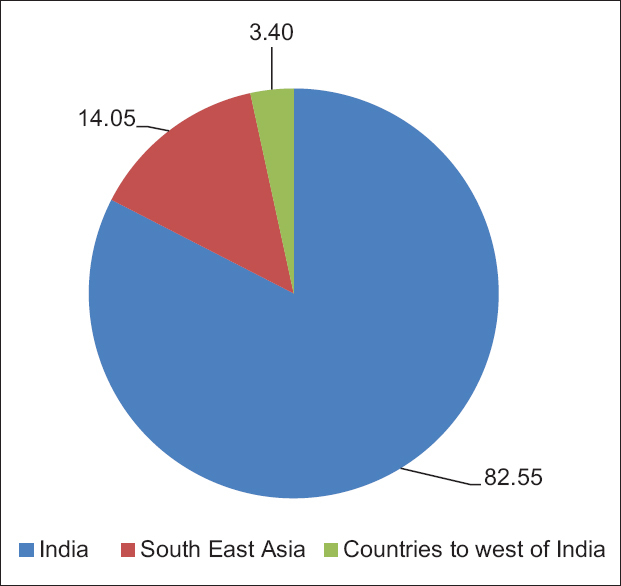 As study was carried out in 11 countries, we analyzed results in three groups viz India, South-East Asian countries (Sri Lanka, Vietnam, Philippines, Indonesia, Malaysia, Thailand and Singapore) and other countries to the West of India- namely (UAE, South Africa and Nairobi. Results revealed that 82.55% participants from India attended the deep training and 38.95% attended quick training. In South East Asian Countries (Srilanka, Vietnam, Philippines, Indonesia, Malaysia, Thailand and Singapore) 14.05% participated in deep training and 43.96% participated in quick training. 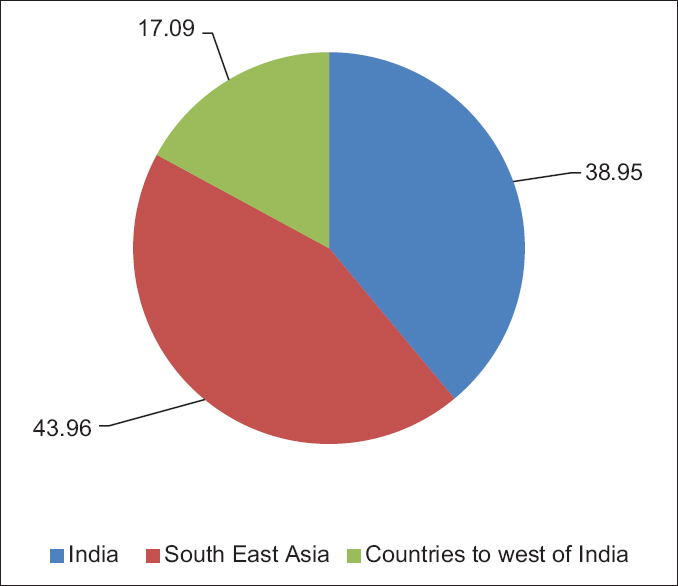 In countries to the West of India (UAE, South Africa and Nairobi) 3.40% participated in deep training and 17.09% participated in quick training, as it was not possible to arrange deep training workshops in these countries due to the busy schedule of employees [Figure 1] and [Figure 2]. When we compared deep and quick training in India, South East Asian countries and other countries located to West of India, it was observed that the result of total agreed (combined agreed and strongly agreed) responses of participants to all parameters was almost similar for all three groups. In India 96.51% participants reported that they agreed to all parameters of deep training and 97.09% for quick training, similarly from South East Asian countries 94.29% totally agreed to deep training and 96.02% to quick training respectively and in other countries located to the West of India, 94.86% and 95.25% totally agreed to deep and quick training respectively [Figure 3]. Hence as results were identical in all the above countries, quick training appears to be the preferred technique as it is effective, practical and replicable, is easier to organize these awareness programs and above all from the feedback comments received, it was very much appreciated by employees as this training did not encroach upon their precious time. In the current scenario prevailing to-day, employees are ready to spare 10 minutes at their work-stations rather than 40 valuable minutes for a power-point presentation in a conference hall venue. When we compared feedback of all participants by converting their responses in a scoring pattern, it was observed that most parameters achieved high scores for quick training. Participants were more comfortable and appreciated the quick training (also evident by their comments in feedback forms) in comparison with deep training in two final groups-India and rest of world [including South East Asian countries as well as countries located to West of India] [Figure 4] and [Figure 5]. When comparing responses received from India and rest of the world [Figure 6] and [Figure 7] it revealed that practicality and replicability were opined as more effective by the participants while other variables were are also having higher scores on the participants. After comparing quick training data with deep training data, it was observed that P values were found significant (P ≤ 0.05) for comprehensive training and influencing behavior modification in India. In rest of the world (Southeast Asia and countries located to West of India) P values were found to be significant for comprehensive training, knowledge enlargement, and skills enrichment [Table 1]. Quick training was also found significant in influencing behavior modification for countries located to West of India. Feedback responses received from participants' on deep and quick training in India, South East Asian countries, countries located to the West of India and rest of the world (combined South East Asian countries and countries located to the West of India), clearly indicate that percentages of total agree responses were high in all places i.e. >92% [Table 2],[Table 3],[Table 4],[Table 5], while total disagree percentage is very low i.e., below 5% in all the places. This clearly shows the remarkable success of the training which was highly efficacious all over the globe with respect to the training parameters including - simplicity and comprehensiveness, practicality, replicability and usefulness, knowledge enlargement, skills enrichment and inspiration to influence behavior modification. A detailed country- wise analysis revealed that responses received from Sri Lanka and UAE on total agree were slightly low. This could be due to English language used by the investigator for conducting training sessions in these countries. Responses on quick training in Durban (South Africa) on total agree were high, i.e. >90%. On the contrary, responses on total agree in Nairobi on deep and quick training were slightly low, again probably because of the language barrier in the country. A use of a translator in such countries is highly recommended. Responses received on deep and quick training in Vietnam were also high on the perspective of total agree i.e. >90%. In quick training in Philippines respondents opined higher percentage on agree i.e. >90%. In Indonesia, equivalent responses were received from the respondents on deep and quick training. Responses received from deep training in Malaysia also showed higher scores on total agree. In deep and quick training in Thailand responses on total agree were marginally low, probably due to language barrier. In Singapore responses on deep and quick training were high on total agree. However, as mentioned earlier, when results of all countries covered globally, including India were combined, the trainings show significant results everywhere. It would be worthwhile to mention here that in countries where language is a barrier, the assistance of a translator and presentations with animation graphics could mitigate these challenges and yield even better results. To summarize, as few employees attend the 40-minute lecture training (though superior) on office ergonomics, the 10-minute live demonstration is a promising, very practical novel intervention as it is brief, undertaken at the workstation, enhancing awareness in maximum employees in a short time, also instilling a feeling of caring and bonding, which is vital for a successful and robust office ergonomics control program. Short intermittent reminders in the form of a card with few tips on ergonomic arrangement of workstations, modular chair adjustments, and a link address featuring a video on desk stretches could serve as an excellent handy desk-reminder emphasizing safer work postures and could augment behavior modification - “small actions-big difference”. From the above description, it is evident that quick training was found superior in providing comprehensive training and influencing behavior modification in India, but all over the world it was found highly superior in knowledge enlargement, skills enrichment in addition to providing comprehensive training (P< 0.05). In countries located to West of India, it also significantly influenced behavior modification. Because few employees attend deep training lectures, the quick 10-minute program is highly promising as it is practical, replicable, yields increased awareness with wider employee coverage in a much shorter time, instilling a feeling of caring and confidence among them toward a robust office ergonomics program. This cost-effective technique could be used by all corporate offices globally to create office ergonomics awareness and influence behavior modification for safer working. This study displaying polar graphs has been extremely useful by proving to be an eye-opener in providing highly cost-effective and practical solutions for enhancing office ergonomics awareness and skills enrichment in global corporate office employees, ensuring maximum employee coverage in shortest possible time in today's VUCA world, agile-working environment, and ever-increasing use of advancing computing technology equipment. Polar graphs prove useful for boardroom decisions to take remedial measures as they depict (1) measurement across corporations, (2) accessibility or feasibility for training in existing scenario If there will be a training matrix for entire corporate structure in this manner, we suggest two types of training—quick (10 minute) training that could be conducted several times, especially during Safety Week or International Labour Day Celebrations and deep (40 minute) training that can be conducted twice a year. In quick training, more employees can be trained and could cover all employees. Enthusiastic, motivated participants can enroll for deep training after completing the quick training. Few enthusiastic employees after completing both trainings could be voluntarily appointed as ergonomics floor champions, ensuring safe ergonomics work practices, practice of desk stretches among colleagues on their office floors, ultimately influencing sustainable office ergonomics practice. These data will be maintained at corporate level to evaluate in the near future; for example, to find the extent of retention of knowledge as well as behavior modification among trained employees. This can lead to propose as a best practice for corporate offices to adopt in order to percolate knowledge at different levels of workers. Hamblin AC. Evaluation and Control of Training. McGraw Hill; UK: 1974. Meyer PJ, Smith AC. HRM Practices and Organizational Commitment: Test of a Mediation Model. Can J Admin Sci 2000;17:319-31. Armstrong M. (2009) Armstrong's Handbook of Human Resource Management Practice. 11th Ed, Kogan Page Limited; London: 2009. Green RA, Briggs CA. Prevalence of overuse injury among keyboard operators; characteristics of the job, operator and the work environment. J Occup Health Safety Aust New-Zealand 1990;6:109-18. Garavan TN. (1997) Training, Development, Education and Learning: Different or the Same? J Eur Ind Training 1997;21:39-50. Berge Z, Verneil MD, Berge N, Davis L, Smith D. (2002). The increasing scope of training and development competency. Benchmarking: An Int J 2002;9:43-61. Beardwell N, Holden B. Managing for Success. 2nd Ed, Prentice Hall Publisher; England: 1993. Andersen JH, Kaergaard A, Mikkelsen S, Jensen UF, Frost P, Thomsen JF, et al. Risk factors in the onset of neck/shoulder pain in a prospective study of workers in industrial and service companies. Occup Environ Med 2003;60:649-54. Talwar R, Kapoor R, Puri K, Bansal K, Singh S. A study of visual and musculoskeletal health disorders among computer professionals in NCR Delhi. Indian J Community Med 2009;34:326-8. Bakhtiar CS, Vijaya RS. attitude alters the risk for development of RSI in software professionals, Indian J Occup Environ Med 2003;7:7-10. Sharan D, Parijat P, Sasidharan AP, Ranganathan R, Mohandoss M, Jose J. 2011. Workstyle Risk Factors for Work Related Musculoskeletal Symptoms Among Computer Professionals in India. J Occup Rehab 2011;21:520-5. Das B, Ghosh T. “Assessment of Ergonomical and occupational Health related problems among VDT workers of west Bengal, india”. Asian J Med Scie 2010;1:26-31. Corlett EN. Background to sitting at work: Research-based requirements for the design of work seats. Ergonomics 2006;49:1538-46. George C. The six-month incidence of clinically significant low back pain in the Saskatchewan adult population. Spine 2002;27:1778-82.